This is probably the most important (and the most commonly lacking) ingredient. You have to have time to think, to ponder the problems you encounter in your networking life, to form ideas, to write them down, and to polish (not too long) and publish them. Without time, blogging won’t happen. Now that I’ve pretty much nailed down the process and have plenty of ideas (current Evernote backlog: 100+ items), I spend around an hour writing a blog post (assuming there’s no background research), finding related material and linking to it. Diagrams take more time. If you want to write a blog post a day, you need an extra creative hour every day. Obviously you can’t do anything creative when you’re stressed out or dead tired – you have to find time when you’re fresh and creative. What works for me might not work for you, but I get best results just after the morning coffee – either when the kids leave for school or early in the morning before they wake up. You might be more creative late at night; find the optimal spot and make sure nothing takes it away. The creative part of the process depends on what time of person you are. I’m mulling over individual ideas for days if not weeks (sometimes months) and then they suddenly burst out when least expected. Sometimes I would record them on my smartphone, or write them down – it’s important to capture the burst quickly, or I might lose the thread of thoughts. Greg Ferro uses a totally different approach; if you’re seriously considering blogging, you (RFC 2119) MUST read his Arse First book, which has tons of extremely useful tips and tricks. The most important thing: don’t get tangled in technicalities. It’s important to get the content out there, it doesn’t matter what font you use or what web page design you have while you’re writing your first blog post (just make sure you’re not using something left over from Geocities days). Spelling errors are a different beast; they show lack of professionalism and/or ignorance (spellcheckers are there for a reason). If you’ve just started blogging, it’s best if you join an established blogging platform – PacketPushers would be an ideal choice for a networking blogger – to get immediate visibility. Having two random page views a day for the first six months is so depressing. Also, the PacketPushers got all the details nailed down – they have a platform, design, fonts … When you get to a daily schedule, then it makes sense to start considering your own web site. Scheduling features available on most blogging platforms are a great help – when you get a creative burst, write several blog posts and schedule them days in advance. If you post them all at once, nobody will read them (we all have severely limited attention span). You won’t get anywhere without a pinch of motivation. Maybe you want to write down the things you’re doing for future reference, or document your studying process, or give back to the community. In my case, it was an interesting experiment: would other people be interested in the same set of topics as I am? The actual reason doesn’t matter, but you MUST find it and you MUST believe in it. It must be something you REALLY REALLY want to do. If you try to blog because everyone else is blogging and because it seems so cool, you won’t get anywhere. After a while, blogging becomes easier, after a year or so it becomes a habit. Like all habits, when blogging becomes ingrained in your subconsciousness, you actually start feeling bad if you don’t blog for a while. After a while, they appear spontaneously and you just have to make sure you capture them immediately (you wouldn’t believe how many blog posts I lost because I never wrote down a great idea I got while showering). Environment helps. You’re most creative when you’re relaxed, when you’ve managed to turn off all distractions, and when you have time. I usually need a quiet spot, and solitary mountain biking (that I need anyway to replenish my introvert batteries – more about that in a Packet Pushers podcast) in deserted woods works best, particularly when I get bored with bird chirping and start listening to the Packet Pushers or Cloudcast.net podcasts. 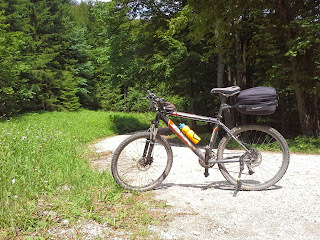 For example, a single bike trip during which I dictated this blog post generated five other posts. Like every other thing, blogging seems hard until you try it. Figure out why you’d want to blog, get Greg’s book, read it, find some time when you’re most creative and off you go! Have been trying to become a networking blogger for some time. This post shows me the way !!! All tips in this post is what you can do to help yourself blogging. The other parts come in a packet called professional life. If you are lucky enough to work for an employer which understand that your self developing career and knowledge gaining are driven also by blogging, social network interaction and so on...not only by spending 8 hours at office, then you may have the extra ingredient to spice up your blogger life. This is the main thing I struggled with when I first started blogging and I know that it's something many others struggle with as well. It can be hard to create momentum in the beginning but once you do, the ideas can start flowing like crazy. Great tips for staying consistent with blogging and awesome blog as well. Thanks for the great tips. Great tips for dealing with this issue!